Pomegranate and Apple Jelly. One spoonful will tell you this is not the wobbly children's dessert made by stirring a fruit flavored powder into water. This homemade jelly uses real fruit juices so you get to appreciate the intensely tart yet sweet flavors of the pomegranate and apple. Serve it on its own, or with a sprinkling of pomegranate seeds, a dollop of whipped cream, a scoop of vanilla ice cream, or a drizzling of custard sauce. Of course, we need to set the fruit juice and I use unflavored powdered gelatin. It is commonly sold in a small box which holds four paper envelopes, each containing 1/4 ounce (7 grams) (scant tablespoon) of tiny granules. These granules are tasteless, colorless, and odorless and in order for them to become a thickening agent, you need to first soften them in cold water until they become all swelled and spongy. Next, the gelatin needs to be dissolved in a hot liquid. Always check to see if the gelatin has completely dissolved, by dipping a spoon into the hot liquid to see if it's clear. While this recipe uses powdered unflavored gelatin, you can also use the clear, paper-thin leaves (or sheets) of unflavored gelatin. It's widely used in Europe and in North America you can sometimes find it in gourmet or specialty baking stores, or on line. To use this type of gelatin, you first soak the sheets in cold water until they look like wet plastic wrap. The sheets are then heated until liquefied. One sheet of gelatin will usually gel about 1 cup (240 ml) of liquid. Pomegranate Jelly: Sprinkle the gelatin over 1/3 cup (80 ml) of cold water. Let this mixture sit for about five minutes, or until the granules have become swelled and spongy. Meanwhile, in a saucepan, heat the pomegranate juice and sugar until very hot (do not boil), stirring constantly to dissolve the sugar. Next, stir the softened gelatin into the hot juice and place this mixture over a low heat and stir constantly until the gelatin has completely dissolved. Again, do not boil. Remove from heat and let cool for about 10 minutes before pouring equal amounts into six - one cup (240 ml) serving glasses. Refrigerate for about 3 - 4 hours or until set. Apple Jelly: Once the pomegranate jelly has set begin the apple jelly. Sprinkle the gelatin over 1/3 cup (80 ml) of cold water. Let this mixture sit for about five minutes, or until the granules have become swelled and spongy. Meanwhile, in a small saucepan, heat the apple juice and sugar until very hot (do not boil), stirring constantly to dissolve the sugar. Next, stir the softened gelatin into the hot juice and place this mixture over a low heat and stir constantly until the gelatin has completely dissolved. Do not boil. 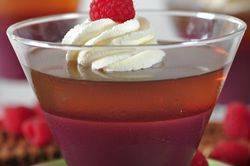 Remove from heat and let cool to room temperature (about 20-30 minutes) before pouring over the set pomegranate jelly. Refrigerate for about 3 - 4 hours or until set (can be made a day ahead). Garnish with fresh pomegranate seeds and/or softly whipped cream or vanilla ice cream. Serves 6. Preparation time 40 minutes.